One stormy summer night, Olive and her best friend, Rose, begin to lose things. It starts with simple items like hair clips and jewellery, but soon it’s clear that Rose has lost something bigger; something she won’t talk about. Then Olive meets three wild, mysterious strangers: Ivy, Hazel and Rowan. Like Rose, they’re mourning losses – and holding tight to secrets. When they discover the ancient spellbook, full of hand-inked charms to conjure back lost things, they realise it might be their chance to set everything right. Unless it’s leading them towards secrets that were never meant to be found . . . 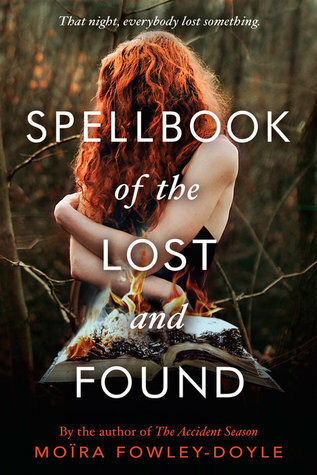 This book has a really cool and unique concept and made me realize that I really need to read more books with spellbooks and charms and the likes. I really like the idea of the give and take of the charms and also the fact that when it comes to the supernatural, what you see usually isn’t all that you get. All of the plots were captivating and I felt like I was right along with the characters, trying to figure things out. The characters were well-written and I really liked that each was dealing with their own crap while also dealing with crap as a group. There is a twist towards the end of the book (don’t worry, no spoilers here!) and I felt that once it was revealed, the pacing was a bit rushed. I would have liked to have seen more emotional reaction from the characters. Everyone seems to just accept the twist and continue one, which didn’t ring 100% true to me. With that being said, this book is definitely one that I would recommend. The writing is tight, the concept really cool and over all it was a great YA read.